It has been a busy summer for Idyll Time and the crew. Since being back at home on the Tennessee River, several small trips to downtown Chattanooga were taken. Staying on the city docks downtown is certainly enjoyable and makes it easy to visit our city. 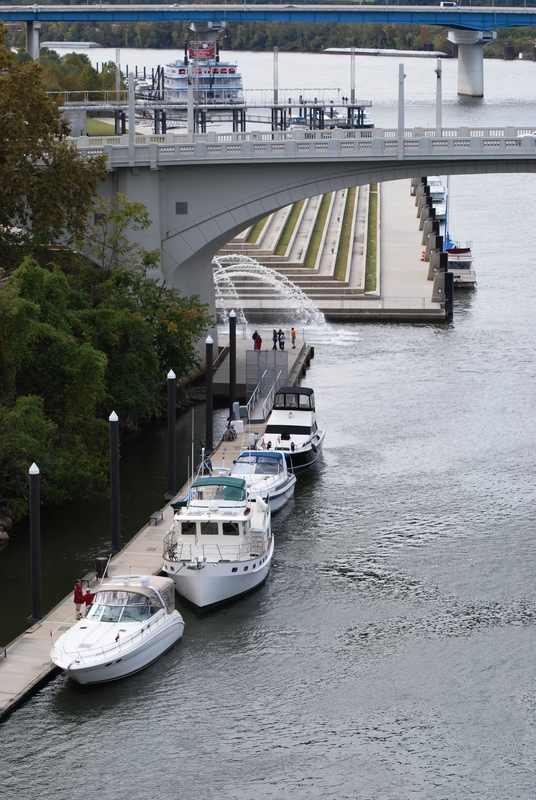 With only one lock, Chickamauga to transverse and less than 10 miles from our home berth at the Chattanooga Yacht Club (CYC), it is a quick and easy trip. The Admiral enjoys staying on the docks downtown as there are events going on most every weekend; plus she gets to eat out at one of the many great restaurants downtown. Two big events with IT were undertaken during the summer cruising season. 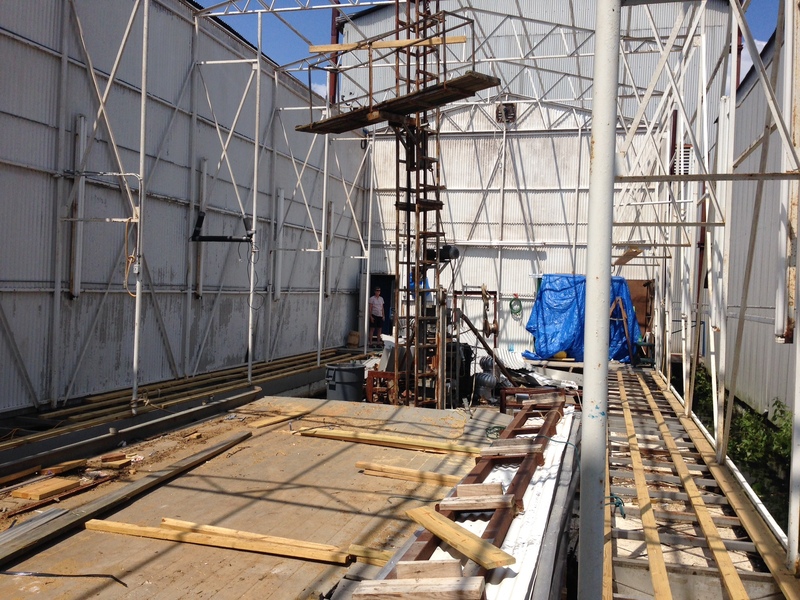 The first and certainly the longest was a complete rebuild of our 40 year old boat house. Most everyone at CYC keeps their boat in a boat house, really just a big floating garage with a huge overhead electric garage door. 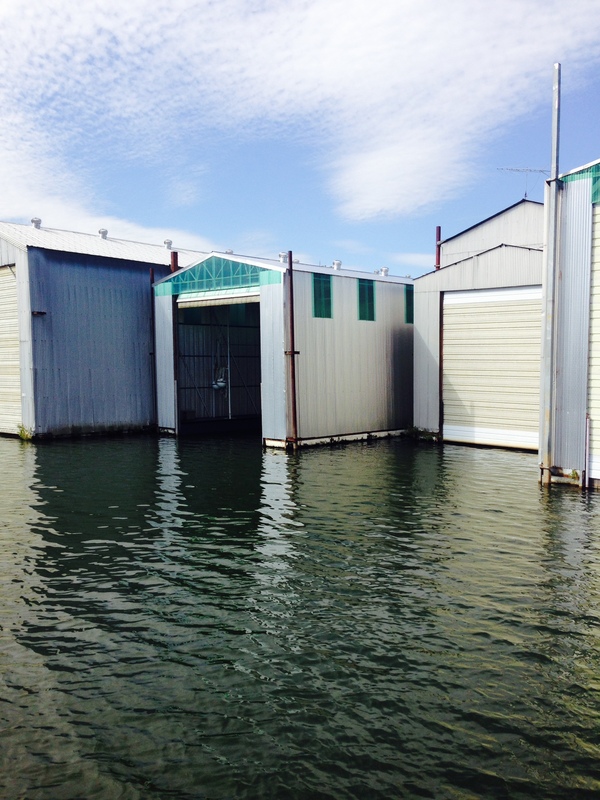 Our club has over 200 of these floating houses of various sizes, some as long as 125 feet. The community docks (called “Rooster” docks- I don’t know why, they just are) are available to all club members for free on Friday, Saturday, and Sunday (this includes water, cable TV, and high speed WiFi). A small charge of 10 cents/ft/day is charged for their use during the weekdays. In July, we decided to have new corrugated steel siding and roof installed to replace the old steel, new florescent lights and the old marine plywood deck replaced with TREX composite decking. 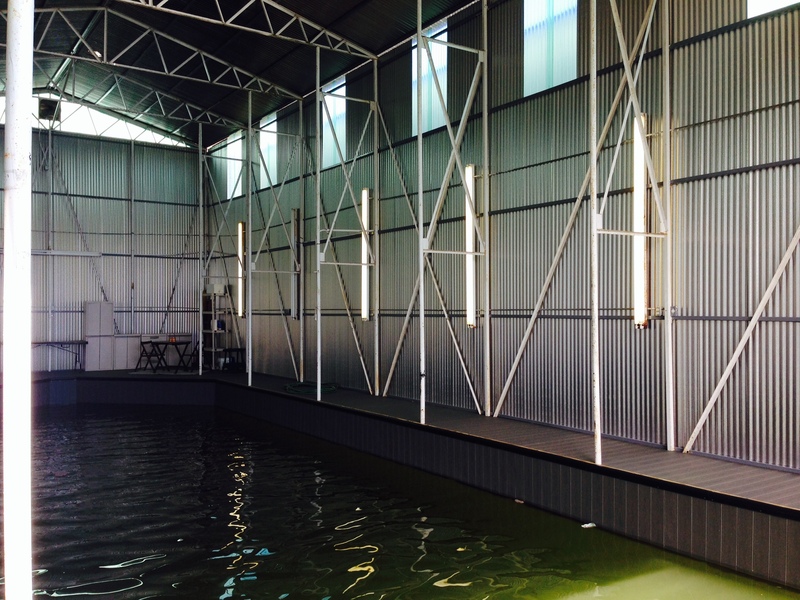 The steel frame and Styrofoam floats were judged by the contractor to be in excellent condition and did not have to be replaced. That was a huge saving of both time and money. After getting contractor bids and selecting the crew to do the remodel, we moved out to the Rooster docks for what we were told would be 3 weeks while the construction was done. Weather delays and other pressing jobs by the construction crew stretched the job to almost 9 weeks! Finally, though, in October all was ready for IT to slip back into her berth inside of what now looks like a new boathouse. While having IT outside for this extended time wasn’t what we had planned, it was really the same as if we were actively cruising for the summer on the TN River. The clean air and fresh water environment meant she didn’t get too dirty while being outdoors. Needless to say, we are not only glad to be back under our own roof but now that we’re home in a new house, we are going to be reluctant to leave later this fall for points south as that is our short term cruising plan. When we will leave exactly is still being discussed between the Admiral and crew. 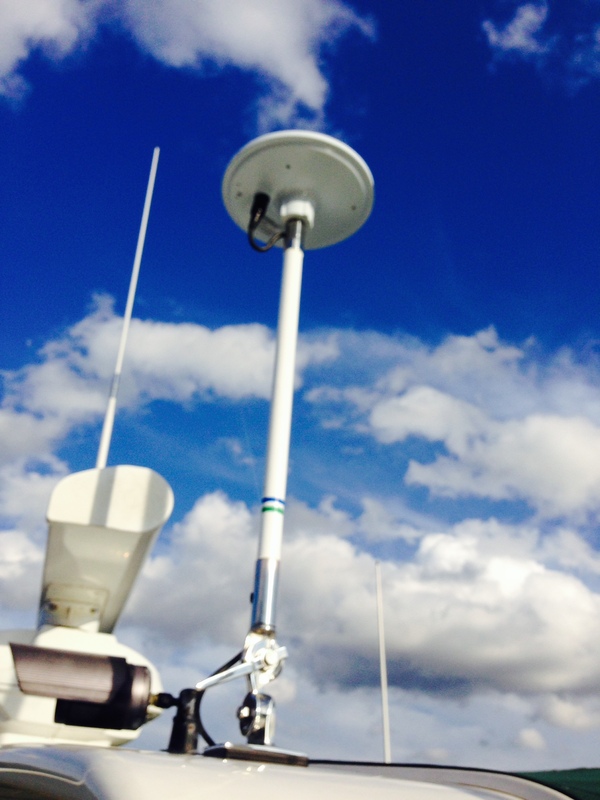 The other big undertaking for IT was an electronic upgrade of several boat/navigation components. Since commissioning IT in 2006, a lot of things in the electronic world have evolved. Boat electronics are no different than our home computers and phones, and we all know how rapidly those things have changed. Our first modification was to our AIS (automated information system). AIS is an automatic tracking system required on most commercial vessels. The electronic exchange of data with other nearby ships includes position, course, and speed. AIS is purely optional on private vessels. We currently have only the receive side of AIS, meaning we could see the ships with AIS on our computer screen but they could not see us. Since we do a lot of cruising on the rivers with lots of high barge traffic, we felt that by being able to transmit our location to the barges would add another level of safety. 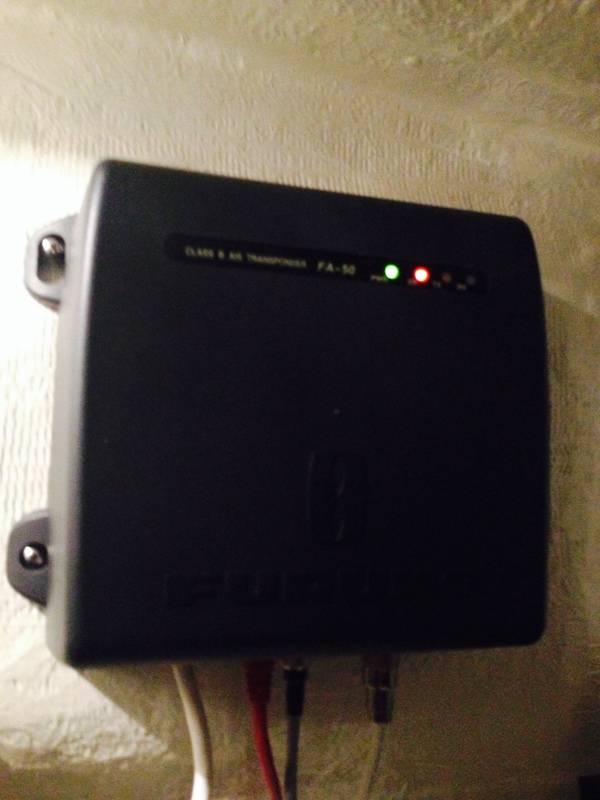 After consulting with our boat electronics guru, Scotty, about our options, we decided to purchase the Furuno AIS-B unit. Scotty installed all of our electronics in 2006 when we commissioned IT so he knew what we had, what would work and where to place things; it was a no-brainer to have him do the work. The only problem is getting him here to TN. Because he is such a well regarded Krogen guru and is constantly in demand by other boat owners, scheduling him to make the trip from Solomons, MD to Chattanooga,TN was challenging. 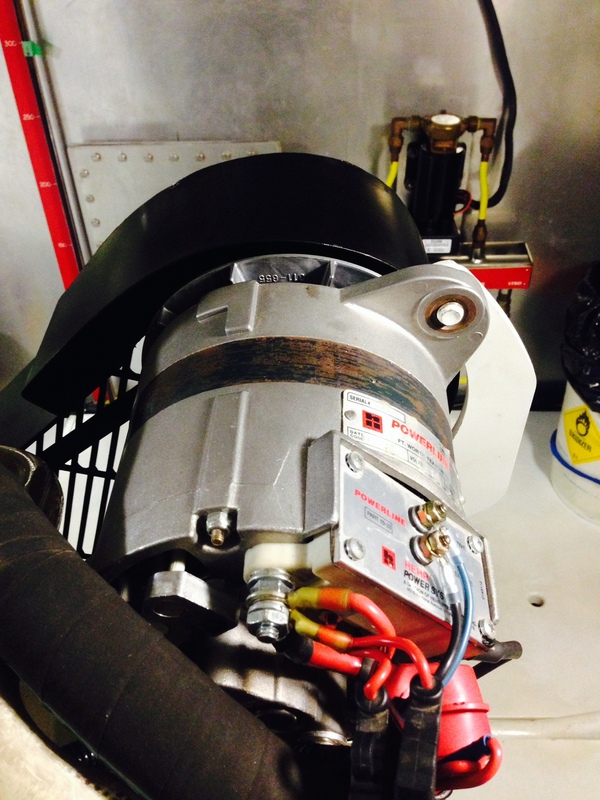 Our second project was to replace our original 160 amp Balmar alternator with a new and improved 275 amp one. For this replacement we also needed a John Deere modification mounting kit. These parts were ordered ahead of Scotty’s arrival and painted bright white just like the rest of the main engine. By having 275 amps available for charging and running, we should be able to turn off the Northern Lights generator earlier and let the new alternator finish charging our house batteries after spending a night “on the hook”. Our third project was to add a digital TV antenna. We have satellite TV aboard IT but were not able to receive open-air TV broadcasts, especially local stations in whatever location we are anchored. Scotty recommended the Majestic UFO X. 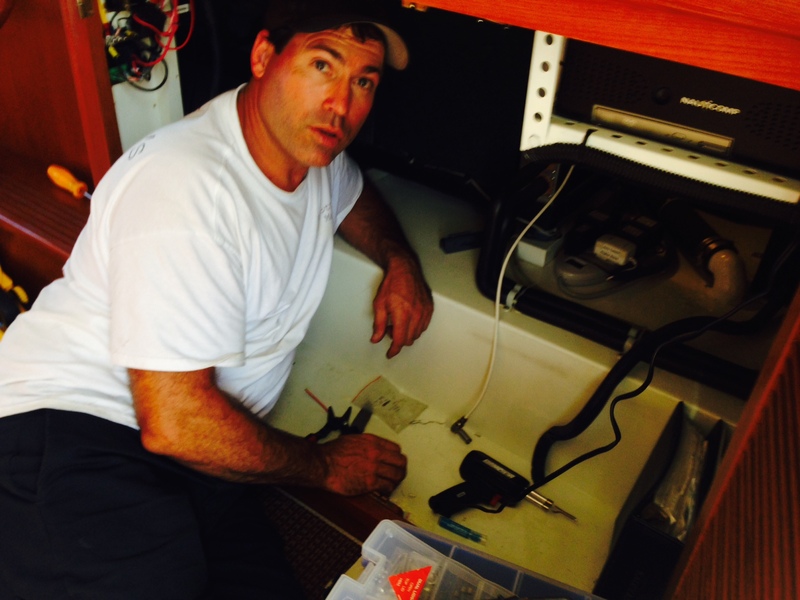 In addition to the TV antenna, we also purchased new coax cable to run throughout the boat. This new shielded cable helped improve our TV picture quality. With all of the parts in by late September, the challenge was to now get Scotty here to TN. Finally after a few gentle phone calls along with the promise of strong coffee (no fu fu stuff for Scotty! ), peanut butter fudge brownies, and good ‘ole TN smoked BBQ ribs, Scotty made it to TN in early October. A frantic but fun two long days were spent installing the above mentioned electronics. We have always enjoyed our time spent with Scotty and value the friendship that has developed over the years with him. And it all worked perfectly after installed!! Of course it would. Scotty loaded up all of his magic tools and hurried back to Solomons, MD early (leaving at 4 am) Sunday morning, just in time to help some frantic boat owners attending the Krogen Cruisers Rendezvous. He was aboard a boat and deep into repairs by 3 pm that same day. The guy never stops. He said the remaining brownies and cookies packed by the Admiral in his travel bag helped fuel him at the end of a very long day. The question now remaining for the crew of IT is when to push away from our dock here in Chattanooga and where do we go? The Admiral would like to experience the Keys and maybe the Bahamas this winter so it looks like that might make a good destination. After that, maybe the East Coast ICW, Chesapeake Bay, and Lake Champlain via the Erie Canal this summer. Stay tuned for details. This entry was posted on October 16, 2014 at 6:00 pm. You can follow any responses to this entry through the RSS 2.0 feed. You can leave a response, or trackback from your own site.